Most people who live in democracies today thumb their nose at monarchies of the past believing themselves much more enlightened today. I, on the other hand, think the people today are much more ignorant and less enlightened then their earlier counterparts. People in democracies today don’t think they have rulers. 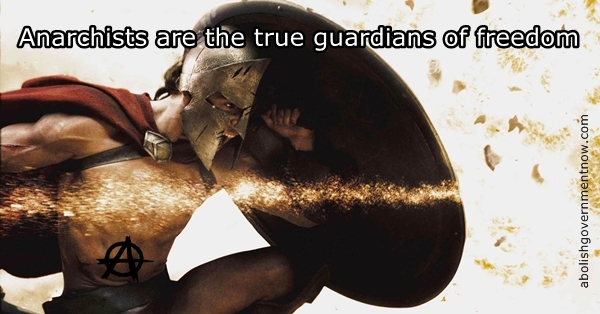 They do. They have this delusional idea trained into them at a young age and reinforced throughout their lives that their rulers are somehow not their rulers, but their representatives. This notion, when thought about, becomes absurd. When somebody, whether singly or in a group, writes rules for you to obey, they are your ruler not your representative. Democracies are not self government. The rulers in a democracy are voted in instead of born in. That is the only difference. People living under a monarchy had no delusions about who the rulers were. They may have had no choice about who their rulers were, but they knew who was in charge. They obeyed out of fear, not out of a misguided sense of obligation. People of democracies today laugh at the notion that people living under monarchies believed in the divine right of kings. Did the people living under monarchs believe in the divine right of kings? Some maybe, even a majority maybe. This was the brainwashing of the times. The indoctrination of the times. 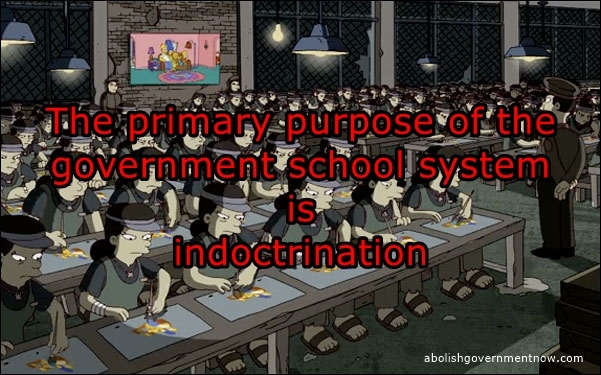 Today the brainwashing, indoctrination is different, but the results are the same. 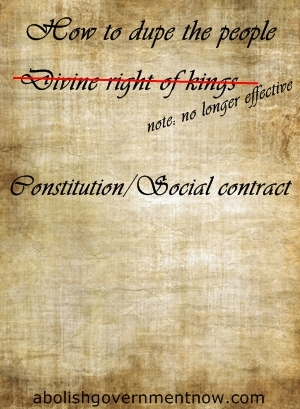 People believe other people have the right to rule them because of the “social contract” or constitutions. Why does a simple piece of paper called “The Constitution” give some people the right to rule over other people? It doesn’t. But people think it does. Just like people thought the divine right of kings gave some people the right to rule over other people. Voting is something that people living in a democracy have that the people under a monarch didn’t have. This is precisely the reason why the people of today are more ignorant. Voting, in the minds of the people, gives legitimacy to the rulers. This gives them the idea that they have some say in what the rulers do. They don’t. The only thing it does is gives them the very slightest say in who their rulers will be. That is all. There is no choice to be free. Voting is also the thing that guarantees a democracy is more oppressive and tyrannical than any monarchy. If you doubt that statement, research how much taxes the colonists paid under King George against how much taxes are paid today. It’s horrifying. Voting put Hitler in power. Voting put Stalin in power. A democracy guarantees that the rulers will be psychopaths. Under Monarchies, the rulers are born into their positions. They may or may not be psychopaths. Most of them won’t be. A very small percentage of people are psychopaths. Under a Monarchy the odds are that the vast majority of the rulers will not be psychopaths due to simple percentages. In a democracy, the people who become part of the ruling class come from the entire population pool of the country. In politics, the most ruthless get to the top. Psychopaths are drawn to the power. They want to rule over people. A monarchy didn’t allow this to happen. But in a democracy, they get their opportunity. The psychopaths lie, cheat, steal, charm, even kill, in short, they do whatever it takes to get into a position of power. They have no conscience about who they harm on the way or who they harm after getting power. That’s what makes them psychopaths. When you look at the people in the highest government offices of a democracy, you can be certain that nearly every one of them is a psychopath. 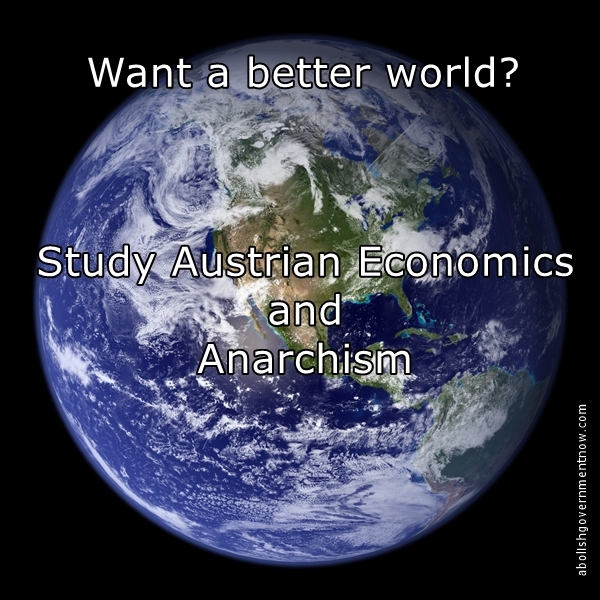 Anarchists talk of freedom. We talk of a world without rulers. Humanity can live in peace with one another without having a ruling class. Do something productive with your life. Don’t go off and fight in a war for the psychopaths or do the psychopaths’ bidding as a tax collector or a cop or a government school teacher. Don’t contribute to the enslavement of other people. 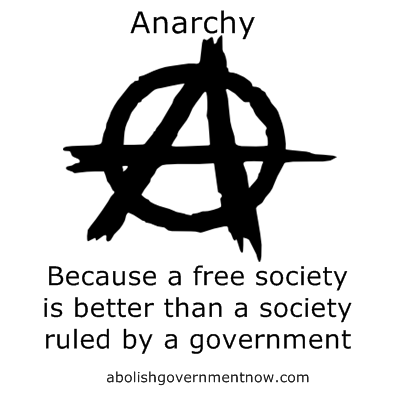 Because government is nothing more than a slave master. It rules people’s lives. It takes the product of people’s labor by force in the form of taxes. 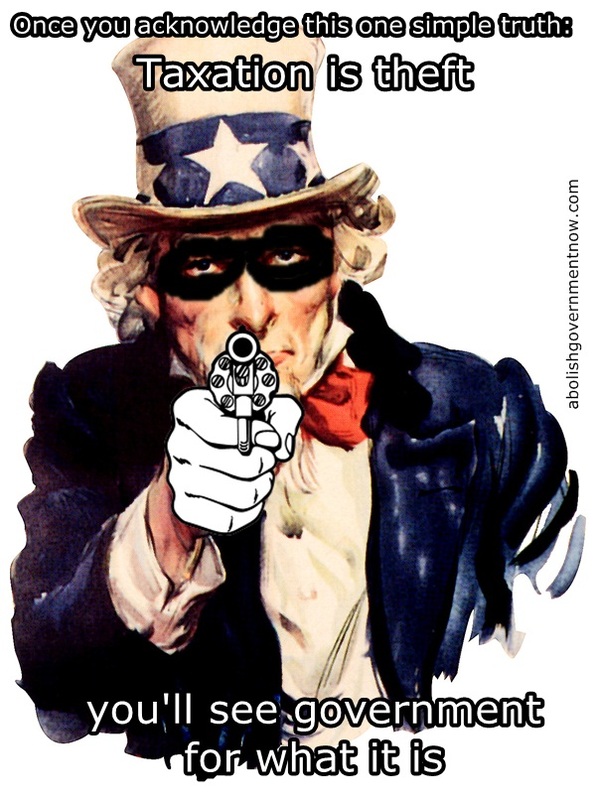 It’s time for government to be abolished!